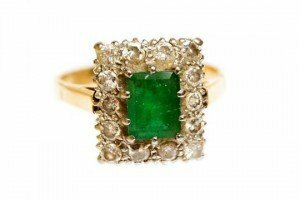 An emerald and diamond cluster ring, claw set rectangular step cut emerald with a border of fourteen brilliant cut diamonds, stamped 18ct. 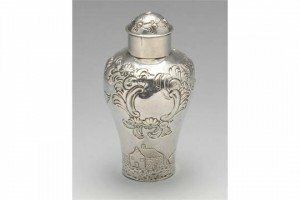 A George II silver tea caddy, the tapered body with bulbous shoulders, embossed and chased with a pastoral scene with birds and insects in flight. 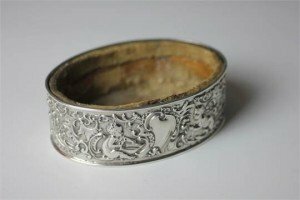 Hallmarked London 1752. 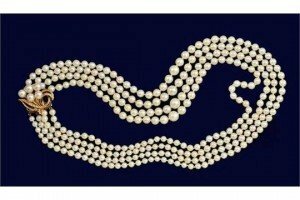 A four row cultured pearl necklace, graduated from the front, on a gold and pearl clasp marked 14k. 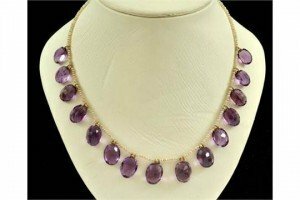 An Edwardian Seed Pearl and Amethyst Necklace, the seed pearl necklace supporting fourteen oval shaped amethysts. 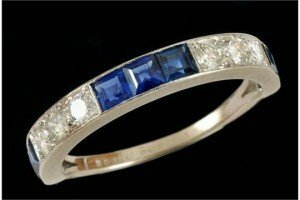 An 18ct gold sapphire and diamond half circle eternity ring, alternating with square shaped sapphires and circular cut diamonds, marked 750. 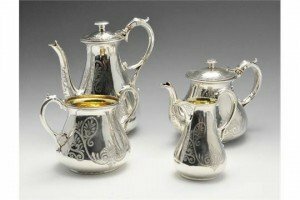 A Victorian silver four piece tea service of tapering bellied form and engraved with Anthemion style motifs. Hallmarked Stephen Smith & William Nicholson. 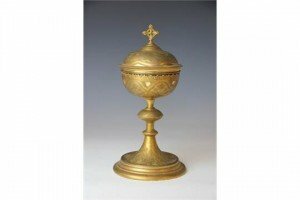 A French silver and gilt metal chalice and cover, 19th century, with engraved flora and fauna, the cover with conforming decoration and with cross finial. A Victorian silver oval trinket dish and liner, Samuel Walton Smith, Birmingham 1889, decorated with cherubs and scrolls. 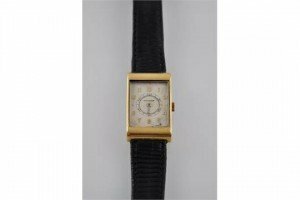 A Jaeger Le Couture yellow gold and stainless steel vintage gentleman’s wristwatch, the cream dial applied gilt Arabic numerals with subsidiary seconds dial. 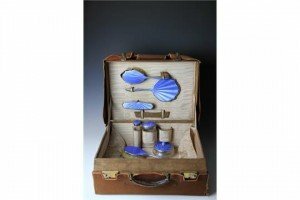 A George V pig skin dressing case with silver and blue enamel fittings, comprising cut glass bowl and cover, two jars and covers, four brushes, a mirror and a nail file. 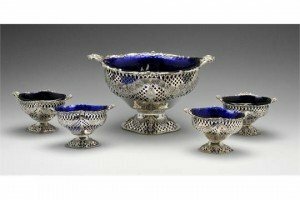 A late Victorian silver matched set of five pierced dishes with blue glass liners, comprising one large dish and four smaller dishes, each of lobed oval form to a pedestal foot and having an applied floral scroll rim above oval and diamond pierced sides with embossed floral swags. 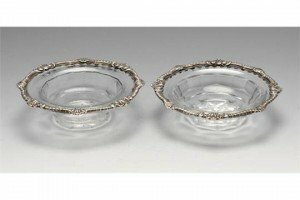 A pair of silver mounted cut glass dishes, the faceted bowl rising to the everted rim with shell and gadroon silver mount. 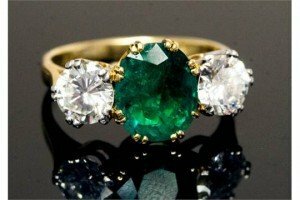 An emerald and diamond three stone ring, the central oval mixed cut emerald weighing approximately 2ct, two round brilliant cut diamonds weighing a total of approximately 1ct, the emerald claw set to 18ct yellow gold setting and shank. 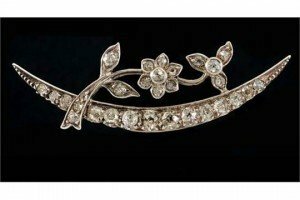 An Edwardian diamond brooch, designed as a crescent with flowers, claw and collet set with circular cut stones. 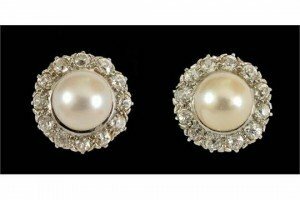 A pair of Mikimoto cultured pearl and diamond cluster earrings, each with a single cultured pearl within a frame of brilliant cut diamonds. 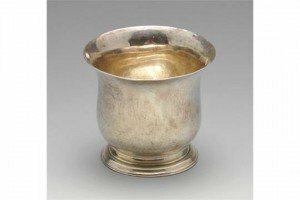 An early George III small silver bowl of plain baluster form to a skirted base and having a simple line border to the everted rim. Hallmarked London 1772. 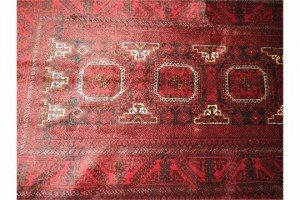 A fine North East Persian Turkoman rug with repeating elephant foot motifs on rouge field within complimenting stylised geometrical border. 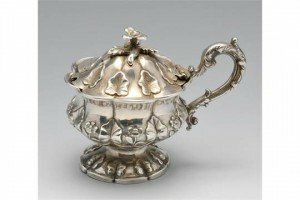 A William IV silver mustard pot of bulbous form to a footed base with petal rim, decorated throughout with borders of flowers and leaves and with a flower finial to the hinged lid, having a foliate scroll handle and a blue glass liner of conforming shape. 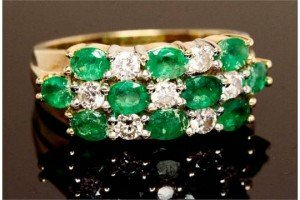 An emerald and diamond set fancy cluster ring, ten marquise shaped emeralds and seven round brilliant cut diamonds in three rows, 14ct yellow gold. 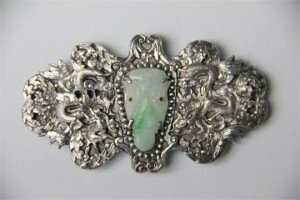 A Chinese silver and jade set buckle, decorated with two dragons within a foliate border.